CHESTNUT HILL, Mass. 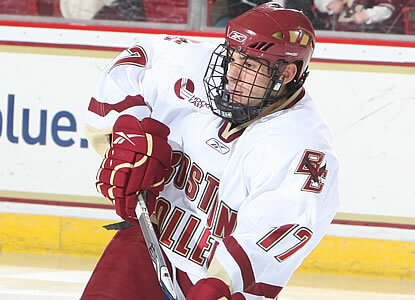 - Six players scored once and Boston College used a four-goal second period to propel the seventh-ranked Eagles to a 6-0 Hockey East victory over Vermont before 4,909 fans at Kelley Rink. Senior goaltender John Muse made 20 saves in 52:43 to capture his eighth victory of the season and the 70th of his career. Junior goalie Chris Venti stopped four shots in the final 7:17 to preserve the shutout, the team's fourth of the season. Brian Gibbons led all players with three points - one goal and two assists - while Paul Carey and defenseman Brian Dumoulin each tallied two-point performances. Gibbons opened the scoring with the only goal of the opening period at the 18-minute mark before the host Eagles scored four times in the middle frame. Cam Atkinson doubled the BC lead at the 2:57 mark with his 11th goal of the year. Defenseman Patch Alber scored BC's third goal midway through the period and Carey lifted BC to a 4-0 advantage with a power-play goal at 14:27. Jimmy Hayes concluded the second-period scoring with 42.4 seconds remaining in the frame. Sophomore Pat Mullane scored the lone goal of the third period, one-timing captain Joe Whitney's feed from behind the net at 12:43. Vermont junior goaltender Rob Madore stopped 20 shots in the losing effort.